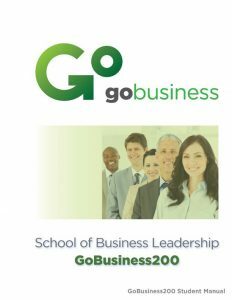 The School of Business Leadership is a two-year course that involves both an annual conference component (GoBusiness Intensive) as well as an online curriculum and mentoring component. It operates through online training supported by Facilitators and real time group interaction. Enrollment runs year round with new groups forming quarterly. In the United States, an annual event is held each Spring. The event is open to all, but is a requirement for those continuing onto GoBusiness200 (the second year of the GoBusiness course). Those planning to enroll in GoBusiness100 (the first year of the GoBusiness course) are encouraged to attend, but are not required. The goal of the Intensive is to inspire and envision attendees, and to lay a foundation that will help prepare them for the curriculum and mentoring component that will follow throughout the year. Students work through the curriculum online according to the annual schedule (full curriculum details below). Students participating in the course are required to work with a facilitator with whom they will meet on a regular basis either in person or remotely with their small group. Facilitators are trained and screened by GoStrategic and are assigned at the beginning of the course. Students can expect: 1) Monthly or bi-monthly meetings held in person or via phone/webcast, 2) Each online lesson takes about 2-3 hours total to listen to, process and answer homework; each lesson is allotted @2 weeks for completion. The Mentor-based model is critical to the success of the course. Our desire to see students work with a facilitator is based in our conviction that genuine transformation in a person’s life takes place in the context of spiritual relationships with other men and women. The role of the facilitator is to encourage and challenge the students as they work through the material. Facilitators are all graduates of the course themselves and have also completed a special training school specifically designed for GoBusiness Facilitators. GoBusiness100 focuses on the fundamental differences between conventional economics and Biblical economics. Enrollment includes curriculum and Facilitator oversight. GoBusiness100 has ongoing open enrollment with new groups starting every quarter. 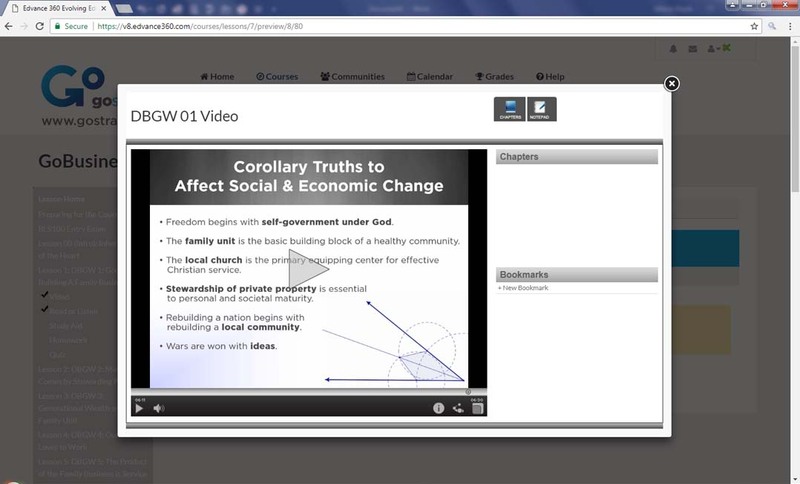 Curriculum includes 19 audio teachings, a book and the accompanying student manual. All components of BLS100 feature Dennis Peacocke. Lesson 8: How Big is Your Vision? Lesson 10: Where is the Value? Curriculum includes 24 exclusive audio teachings, the book Good to Great and the accompanying student manual. Audio components of BLS200 include teachings by Dennis Peacocke, Tom Burtness, and Dr. Gerald Chester. 11. What Is Your Organization Called to Do?